Krampus doling out justice for bad kids! Don’t do it! We just wanted to take a quick second to give people some context for who Krampus is. We are from German, Hungarian, French, Irish, English backgrounds and we all fear Krampus. 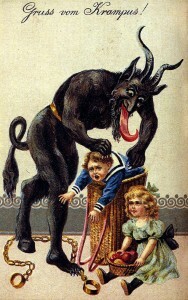 Krampus is represented as a beast-like creature, generally demonic in appearance. The creature has roots in Germanic folklore. Traditionally young men dress up as the Krampus in Austria, southern Bavaria, South Tyrol, Hungary, Slovenia and Croatia during the first week of December, particularly on the evening of 5 December (the eve of Saint Nicholas day on many church calendars), and roam the streets frightening children with rusty chains and bells. Krampus is featured on holiday greeting cards called Krampuskarten. There are many names for Krampus, as well as many regional variations in portrayal and celebration. Have some fun, scare your kids and have a very Happy Holidays!